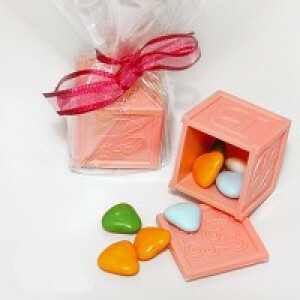 Pink coloured block, 3cm x 3cm containing mini heart shaped sugar coated chocolate sweets, wrapped in cellophane and tied with pink satin ribbon. A lovely favour ready to hand to your guests. Sold individually so you can order the exact quantity that you require.